Exports declined for the first time this financial year, by a moderate 2.15 per cent at $27.95 billion in September, despite rupee depreciating against the dollar. However, this could not widen the trade deficit, which fell to a five-month low as the pace of import growth also slowed. Economists are apprehensive that the trade deficit will again widen, putting pressure on the current account deficit (CAD), in spite of import curbs announced by the government. Imports rose by 10.45 per cent at $41.9 billion in September, against 25.41 per cent in August. September import growth was the second lowest this fiscal year, after the April growth figures of 4.6 per cent, bringing the trade deficit down to $13.98 billion. It was at $17.4 billion in August and $18.2 billion in July. The government was enthused by the trade deficit figures. “The trade deficit is the lowest in five months, despite high oil prices,” said an official statement. Given the country's dependence on imported fuels, the elevated crude oil prices and the modest expected impact of the measures initiated so far by the government to reduce the trade deficit, the CAD is now expected to widen significantly to $75-79 billion or 2.9 per cent of GDP in the current fiscal year, she said. The trade deficit stood at $94.32 billion in the first six months. The government downplayed the fall in exports in September, attributing it to the high base effect of September 2017, when exports grew by 25.67 per cent at over $28 billion. “The decline is due to the base effect, resulting from September 2017 being an abnormally high growth month of about 26 per cent in dollar terms due to the imminent cut off then for drawbacks at pre-GST rates,” the government said in a statement. This is a temporary and an out-of-trend phenomenon, it said, adding that the exporters continue to be resurgent with their realised incomes, having gone up by almost 10 per cent. “India expects to maintain double-digit growth in exports this fiscal despite fragile global recovery and trade tensions,” commerce secretary Anup Wadhawan said. Exports rose 12.54 per cent in the first six months of this financial year. Federation of Indian Export Organisations (FIEO) president Ganesh Kumar Gupta said though the data shows a marginal contraction of exports in September, primarily due to high base effect last year, the aggregate value of exports in September is more than April, June and July. 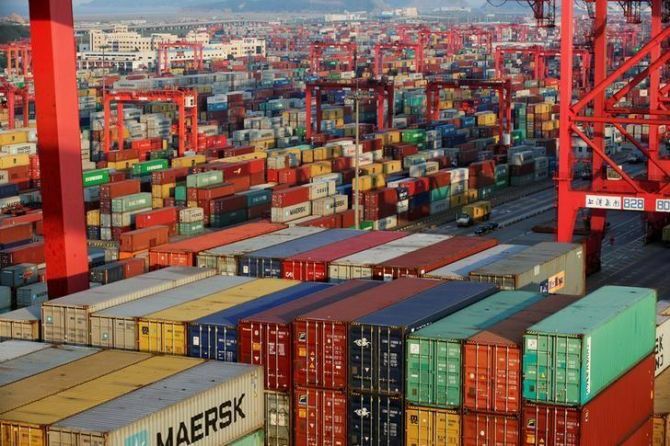 “The overall exports in September are close to $28 billion, which is the minimum we are looking for each month, so as to reach milestone of $350 billion,” he said. Gupta reiterated his demand for augmenting the flow of credit to the export sector as sharp decline in credit, when exports are growing at double-digit, does not augur well for the future. Engineering exports body EEPC India Chairman Ravi Sehgal said decline in exports shows that the rupee depreciation has not been of help as far as the competitiveness of shipments is concerned. “We continue to bear high cost of raw material and interests, besides the uncertainties around the tariff war between major economies,” he said.